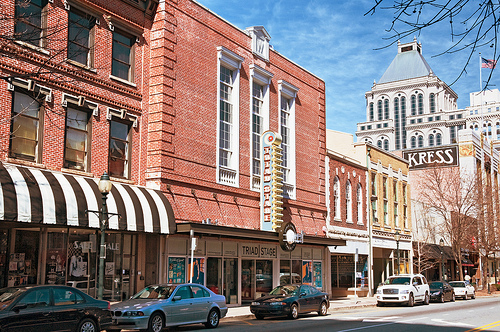 Situated in central North Carolina, Greensboro is the state’s third largest city, with a population of more than 275,000 as of 2012. While many think the city is named for its greenery, it is actually named after General Nathanael Greene, a general who led American forces during the Revolutionary War. According to 2012 Ersi data, Greensboro is 49 percent white, 39 percent African American, 8 percent Latino, and 4 percent Asian. These numbers make Greensboro, for the first time, a “majority minority” city, an important milestone for a city with a storied civil rights movement past, including, famously, the lunch counter sit-in campaign to integrate restaurants and hotels, which began in 1960 at Woolworth’s department store in downtown Greensboro. Greensboro today is a city of contrasts. The city boasts a vibrant downtown known for its art galleries, antique stores, parks, and public art displays. It is also home to five colleges and universities, a community college, and a law school—together employing 6,000 people and educating more than 47,000 students a year. While the city’s economy remains dominated by textile, furniture, and tobacco, it has become more diversified over the years with sizeable insurance, printing, publishing, nanotechnology, health care, transportation, and global logistics industries. As a result, Greensboro has experienced population growth over the past decade of roughly two percent a year. Yet poverty has increased significantly. Between 2000 and 2009, the number of “middle class” households (i.e., those with incomes between $25,000 and $75,000) fell 28 percent. By contrast, the number of households with incomes of less than $15,000 a year increased by 30 percent. This growing poverty has had a disproportional effect on the city’s non-white populations—nearly a quarter of all African American and Hispanic families were considered poor in 2009 compared to just six percent of white families. Greensboro and its residents, however, are not observing these trends from the backseat. Rather, they are actively creating and implementing innovative programs and strategies that capitalize on the city’s strengths to help address these challenges and foster a healthier, vibrant local economy. In fact, just last year, the city won a federal grant, which enabled it to kick off its Strong Cities, Strong Communities Challenge, which offers cash rewards to groups or individuals who develop the best plans to nurture the city’s economic growth. Similarly, at the community level, the Welfare Reform Liaison Project (WRLP), which provides workforce training and job placement services, recently initiated new programs in digital imagery/paper reduction and “green” hospitality to help more residents connect to the city’s growing green economy. Greensboro universities are also working in partnership with the community to help area residents rebuild wealth. For example, The North Carolina Entrepreneurship Center at the University of North Carolina Greensboro supports community members working to create and grow sustainable enterprises. Founded in 2007, F4DC is a Greensboro-based foundation that has made over $1 million in grants to support grassroots democratic organizing efforts in the Southeast, North Carolina, and Greensboro. With a mission to support community-based initiatives and institutions that foster authentic democracy in communities, F4DC’s work focuses on four key activities: 1) making grants to groups that engage in participatory democracy to further their social change objectives; 2) convening groups and individuals committed to social and economic justice through deepening democratic practice; 3) conducting research; and 4) developing materials to nurture the growth of authentic democracy. Established in 1983, The Community Foundation of Greater Greensboro now manages more than 600 charitable funds and holds more than $146 million in assets. Dedicated to strengthening community, the Community Foundation promotes philanthropy, builds and maintains endowment funds, and directs and supports a range of initiatives that are helping to create a more inclusive, caring, and vibrant Greensboro. In 2012 alone, the Foundation awarded about $11.5 million to a range of community organizations. Founded in 1967 to benefit the greater Greensboro area, the Weaver Foundation supports community improvement, environmental activities, educational development, and the advancement of human and civil rights, racial tolerance and diversity. It has provided support to some of the city's more entrepreneurial nonprofits such as the Welfare Reform Liaison Project and HandyCapable. Grants exceeded $1 million in 2012. The East Market Street Development Corporation is focused on building community and restoring pride in the East Market Street Corridor and East Greensboro. Its mission is to foster an economically vibrant, attractive, pedestrian-friendly, and safe community that supports existing and new businesses. To do so, the organization provides comprehensive economic, business, and community development programs and services aimed to create and sustain community assets. Established in 1979, Choice Community Credit Union now has over 9,000 members and about 30 employees. In 2010, it became a division of Self-Help Credit Union, a state-chartered credit union in North Carolina that serves nearly 39,000 members, both online and through 14 branches across the state. In 2012 alone, Self-Help financed the construction or rehabilitation of 300 housing units, lent $74 million to businesses, nonprofits and community facilities, and lent $22 million to public charter schools and childcare centers, benefiting more than 10,000 mostly low-income children across the country. Moreover, to further its impact, Self-Help works to affect public policy changes that increase economic opportunity and stability for low-income families. College Hill Childcare Cooperative (known as “Co-op”) was founded in 1981 by a group of parents who were dissatisfied with what they found in most childcare centers: high child-to-teacher ratios, low quality of care, and few options for parents wanting to participate in their child’s education. Serving children who are 8-weeks to five-years old, as well as after school care, parent involvement includes working two hours per week as a staff assistant and participating in regular co-op meetings and activities. Deep Roots Market is a consumer cooperative that sells locally and organically grown or made groceries, and buys its products from vendors who practice environmental sustainability, invest in their communities, treat animals ethically, and use fair labor practices. Founded in the 1960s as a small, vegetarian buying club in a Guilford College dorm and incorporating in 1976, today the co-op has over 2,000 member-owners and a staff of 45, and boasts the highest sales per retail square foot of any grocery store in Greensboro. In spring of 2013, Deep Roots moved into a new, larger location in downtown Greensboro, which features a community meeting space, a café, and free wireless Internet. Founded in 1968, Anderson & Associates (A&A) is a 100 percent employee-owned professional services design firm specializing in civil and environmental engineering, surveying, and planning. It has about 85 employee-owners and four offices across Virginia, West Virginia, and North Carolina. 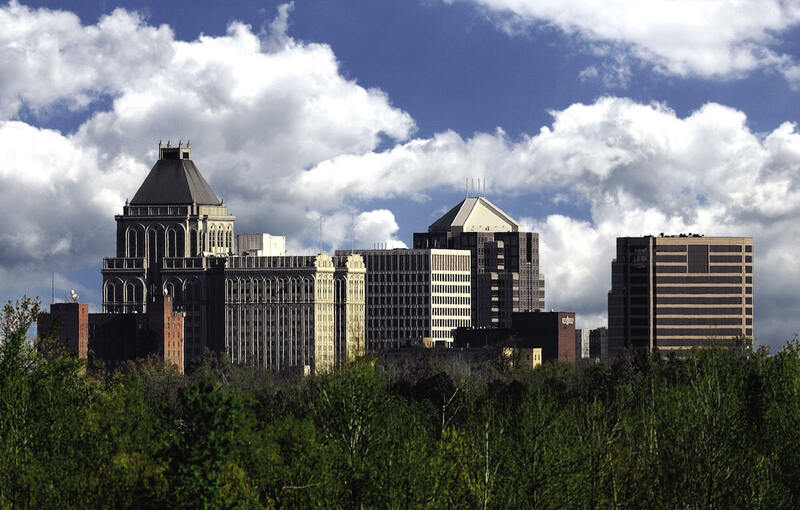 Established in 1989, its Greensboro office specializes in engineering planning and design. A&A places special emphasis on community involvement, with its employee-owners volunteering between 5 to 20 hours a month at a range of local nonprofit organizations. Headquartered in Greensboro, Cross Company provides products, services, and engineering solutions focused on machine automation, process control and instrumentation, fluid power technologies, and systems integration. Founded in 1954, Cross became an ESOP company in 1979, and 100 percent employee-owned in 2006. Today it boasts 200 employee-owners and serves customers across nine southeastern states. Recognizing its commitment to employee-ownership and meaningful employee participation, The Carolinas Chapter of the ESOP Association—a nonprofit membership organization of ESOP companies—named Cross the 2011 Carolinas Chapter ESOP Company of the Year. Greensboro’s Better Building Neighborhood Program aims to promote home energy upgrades, job creation, economic development, neighborhood empowerment, and consumer education. To do so, the program offers all city residents an “energy saver power pack” with compact fluorescent light bulbs, a low-flow showerhead, and an energy saving power strip, as well as a range of financial incentives, including grants, rebates and loans, to encourage participants to make additional updates that will result in at least a 15 percent improvement in their home’s energy usage. From the project’s launch in 2010 through December 2012, the project is credited with conducting 1,432 residential evaluations, completing 217 residential energy upgrades, and training 26 workers in performing energy efficiency upgrades. The Welfare Reform Liaison Project (WRLP) is a community action agency that aims to help low-income families in Guilford County achieve self-sufficiency. To do so, it provides workforce training and job placement in a variety of green-focused industries. One training site is Mattress Go Round, a company that recycles old mattresses, and thus, diverts nearly 3,000 mattresses a year from local landfills. Most recently, WRLP initiated training programs in digital imagery/paper reduction and “green” hospitality. Between 2010 and 2011 alone, about 150 people found jobs after participating in one of WRLP’s training programs. Established in 2004, Guilford County Homeownership Center (GCHC) is a nonprofit organization that offers a range of financial literacy classes. One of its core programs is its Financial Peace University (“FPU”), a 13-week financial literacy course credited with saving families an average of $2,600. It also offers a 6 to 12 month individual development account (IDA) program, which enables participants to establish matched savings accounts that can be used to purchase a first home, open a small business, or fund higher education. In exchange, participants are required to complete economic literacy and homebuyer education classes, improve their credit, establish a budget and savings schedule, and develop long-term money management skills. As one of three cities that won a U.S. Department of Commerce and Economic Development Administration’s Strong Cities, Strong Communities (SC2) grant, Greensboro was able to kick off this Challenge to encourage community involvement in identifying innovative strategies to promote Greensboro’s economic development. Designed as a two-phase competition, the Challenge offers cash rewards to groups or individuals who develop the best plans to nurture the city’s economic growth, and a final $1 million prize to the overall winner. To encourage community participation, the City created a website through which residents and organizations can propose ideas, and rate or comment on other people’s suggestions. Located in Northeast Greensboro, Cove Creek Gardens is a public teaching garden that provides the community with opportunities for research, learning, and interaction with nature. All of its programs and projects are centered on “experiential learning,” an educational concept that combines formal instruction with hands-on practice. About 200 students participate in the Garden’s programs each month. The Garden also conducts numerous community programs that engage diverse populations, including the homeless and HIV/AIDS residents, in the Garden’s initiatives. A Sweet Success is a bakery run by Sanctuary House, a Greensboro nonprofit that supports the recovery of adults with serious mental illness. By working in the bakery, which sells a range of desserts to both individuals and wholesalers, Sanctuary House participants gain job skills and a sense of independence. The bakery not only generates revenues for the nonprofit, but also works to increase public awareness of mental illness. HandyCapable is a nonprofit that was created to provide developmentally disabled adults with an opportunity to perform meaningful work in a nurturing facility. To do so, the organization trains its participants to refurbish computers that have been donated by community residents and businesses, and then it donates the refurbished equipment to other nonprofits and low-income families. Since its incorporation in 2006, HandyCapable has refurbished and donated over 3,800 computers. The Nussbaum Center for Entrepreneurship is a nonprofit organization established to promote economic development in Greensboro and the surrounding area. To do so, it operates a business incubator designed to support new or emerging businesses. Since its inception in 1987, the Center has graduated 130 businesses, and 80 percent of these have succeeded, a rate well above the national average of 44 percent. Moreover, through a partnership with the University of North Carolina at Greensboro Bryan School of Business and Economics, the Center offers an Entrepreneur Assistance Support and Education (EASE) program, which provides graduate-level marketing and accounting interns and discounted graphic design services to local entrepreneurs. Since its inception in 2006, EASE has provided support to over 100 area companies. The Southside neighborhood, a 10-acre revitalization project, is one of Greensboro’s first significant mixed-use, infill projects. Key to its success was transforming Martin Luther King, Jr. Boulevard—which previously cut the neighborhood in half—into a pedestrian friendly “grand urban boulevard” that knits the community together. The project also includes a centralized neighborhood park, 30 single-family homes, 10 two-family homes, 50 townhouses, 10 restored historic homes, and 20 live/work units. Demonstrating this project’s success, tax revenues generated by the neighborhood grew from the predevelopment average of $400,000 to over $10 million. The project also won the EPA’s 2004 Built Projects Smart Growth Achievement Award. The North Carolina Entrepreneurship Center at the University of North Carolina Greensboro aims to help entrepreneurs start and grow their businesses, and to catalyze the creation of sustainable and globally competitive enterprises. To do so, it runs a range of programs to promote entrepreneurship across campus and in the community itself. The Center is currently focused on seven areas: creative industries, family business, franchising, health care entrepreneurship, international entrepreneurship, social entrepreneurship, and technology entrepreneurship.